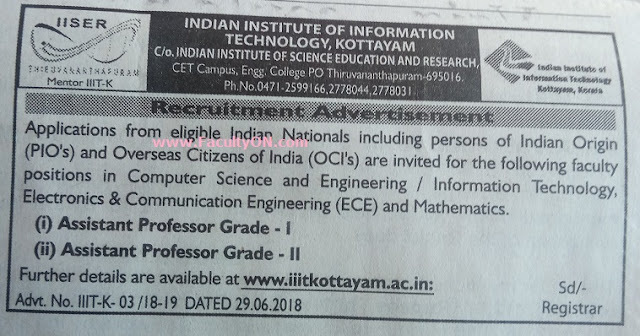 Indian Institute of Information Technology, Kottayam has advertised in the THE NEW INIDAN EXPRESS newspaper for recruitment of Teaching Faculty- Assistant Professor jobs vacancies. Interested and eligible job aspirants are requested to apply on or before 01st August 2018. Check out further more details below. About College: The Ministry of Human Resources Development, Government of India has put forward a scheme wherein 20 new IIITs are proposed to be established in the country. A major objective in establishing IIITs is to set up an education model which can produce best-in-class human resources in IT and which can harness the multidimensional facets of IT in various domains. The IIIT is expected to contribute significantly to the global competitiveness through the key sectors of Indian economy and Industry, focusing on applied research and education in IT in selected domain areas. Now the IIITs are declared as Institutes of National importance under the IIIT PPP Act(2017). How to Apply: Interested candidates are required to apply ONLINE at the official web address given below.